A perfect gift for any Panathinaikos Athens football (soccer) fan! 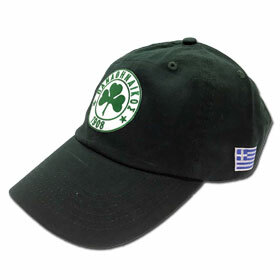 Features the official Panathinaikos (PAO) logo in the center and an embroidered Greek Flag on the left side. Made with unstructured 100% cotton, an adjustable hook/loop tape closure that adjusts from 20" to 24". Make this baseball cap the perfect gift for Father’s Day, Christmas, or a birthday!